Hidden Capacity: How Proper Maintenance and Cleaning of Sewer Systems Can Have Huge Benefits! 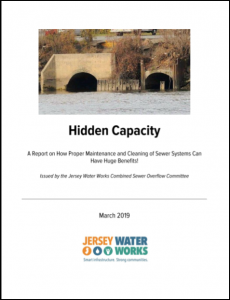 Issued by the JWW Combined Sewer Overflow Committee, the purpose of this paper, Hidden Capacity: How Proper Maintenance and Cleaning of Sewer Systems Can Have Huge Benefits, is to highlight the importance of sewer cleaning and inspection as critical elements of a proper and effective sewer system operation and maintenance program. Additional basic, cost-effective “gray” type controls, which have the potential to reduce combined sewer overflows (CSOs), sewer backups, and flooding significantly, are also presented. The cleaning and proper maintenance of sewer collection systems is relevant to both combined sewer systems (i.e., systems that convey sanitary/industrial flows as well as stormwater) and separate sanitary systems (systems that carry only sanitary/industrial flows). This paper also provides regulatory recommendations to help ensure that municipalities/utilities are implementing these basic, cost-effective control measures and are operating and maintaining their collection systems properly.